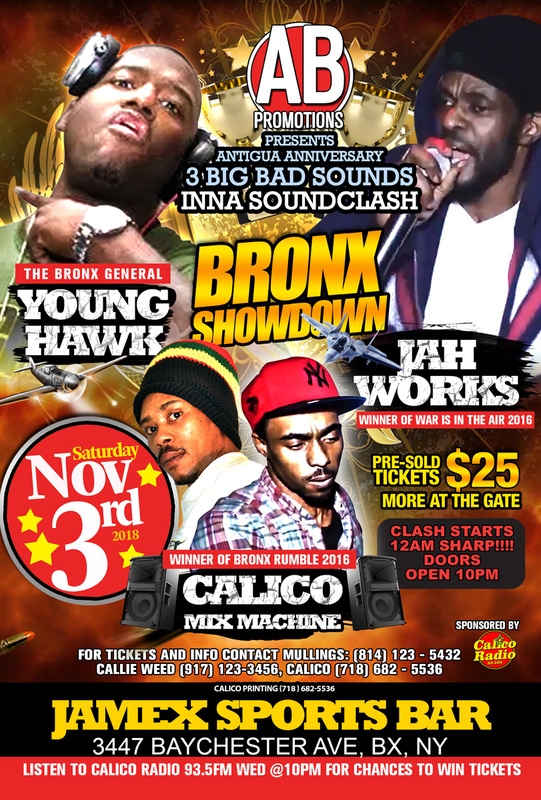 Bronx Showdown Soundclash will feature 3 bad sound from the Bronx, Young Hawk, Jah Works and Calico Mix Machine will battle for the title. It takes place on November 3rd 2018 at Jamex Sports Bar in the bronx. Tickets link Speng Calico or Calli weed from Jah Works sound. Bronx Showdown Soundclash Come out to Bronx Showdown Soundclash to support your favorite sound system or listen to Calico Radio on 93.5fm to win tickets.